Edil Hassan is a poet of Somali background based in New England. Two of her poems appeared in Asymptote’s most recent issue in the feature on banned countries. Ms. Hassan graciously answered a few questions about her work and inspiration. Claire Jacobson (CJ): Your poems are so grounded in deep family relationships and stories from the past. Can you talk about the inspiration for these poems? What drove you to write them? Edil Hassan (EH): The Drought for a long time was only the last stanza. I had seen a picture of a capsized migrant boat in the Mediterranean on some news site—a new picture every week or month, never the same boat. It’s like those videos of Black girls and boys who are killed; I’m waiting to know the person behind the camera. I knew though that this poem was incomplete, and like all stories is layered. 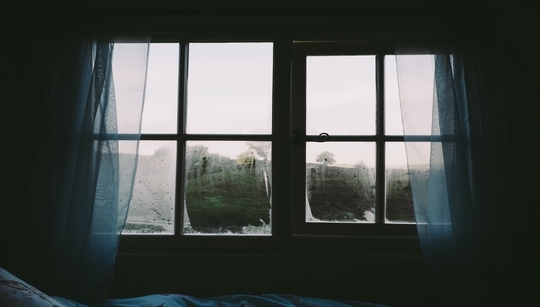 Migration comes with a loss of place, and mediating on family helps me track that disappearance. "The language we choose to write has a powerful political meaning." Ubah Cristina Ali Farah is a poet, novelist, playwright, and oral performer of Italian and Somali heritage, best known for her novels Madre piccola (2007) and Il comandante del fiume (2014). 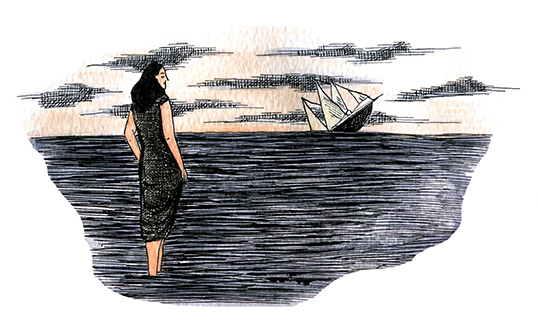 Her piece, “A Dhow Crosses the Sea” recently appeared in the April issue of Asymptote, translated from the Italian by Hope Campbell Gustafson of the University of Iowa. Claire Jacobson (CJ): What can you tell me about the oral storytelling quality of your work? Ubah Cristina Ali Farah (UCAF): While I was studying at the Sapienza University of Rome, my favorite authors were Amos Tutuola, Amadou Hampâté Bâ and the great Brazilian writer, João Guimarães Rosa. I learned to love the oral, anonymous poetry of the medieval bards, the romancero evoked by García Lorca, Italo Calvino’s rewriting of traditional Italian tales, and Pierpaolo Pasolini’s striking collection of popular songs and poems. However, my first loves, the texts that influenced me most, were the Somali oral poems and tales, under the wings of which I grew up. I was looking for the oneiric feeling that resonated in the oral poetry, a text disconnected but at the same time coherent, a voice encompassing both colloquial and erudite styles and registers of language. A storytelling that could embody the throbbing power of the voice. Welcome to Teach This, Asymptote for Educators’ answer to the current issue’s Banned Countries Special Feature. We believe that the classroom is the perfect setting for young people to be exposed to diverse, contemporary voices, both allowing them to challenge their assumptions and to engage them with living literature… a conversation in which their own voices matter. To that end, Asymptote for Educators has launched this weekly blog series in which global educators share how and why they would teach the feature’s articles. We hope you and your students enjoy! Are you an educator with your own lesson plan ideas? 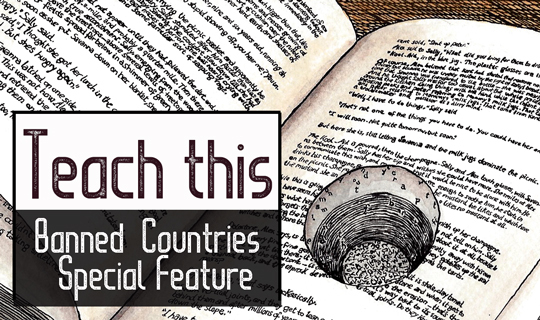 Teach This – Banned Countries Special Feature is currently open for submissions. Email education@asymptotejournal.com for more information. While the work of Ubah Cristina Ali Farah is always situated between two cultures—Somali and Italian—it provides a point of access for students to learn about oral traditions, because despite the author’s long residencies outside of Somalia, these traditions remain present in her writing. Their ubiquity is testament to the very nature of oral stories, which creep into our lives unannounced and perhaps unnoticed, and travel with us. This is how they survive; this is how we survive. The activities below focus on Ubah Cristina Ali Farah’s use of the Somali oral tradition and the question of personal identity in the context of stories that are passed down and retold, and which have become part of the socio-cultural fabric of our being. Besides offering an introduction to these topics, the lesson provides practice for analysis of a literary text and use of a secondary source to enrich our understanding of literature. Thanks to the 77 backers of our Indiegogo campaign who’ve contributed $12,736 so far, there’s already enough for us to launch a call for a Feature on Literature from Banned Countries. As new work from these affected countries will have to be specially commissioned as well as promoted, we will be directly constrained by what we manage to raise. If you’d like to see a huuge showcase to answer Trump’s new travel ban, due to be released any day now, please pitch in with a donation of whatever amount you can afford or help us spread the word about our fundraiser! 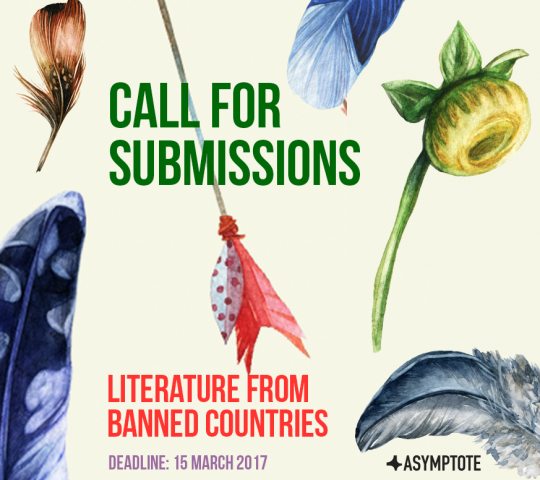 Asymptote seeks hitherto unpublished literary fiction, literary nonfiction and poetry from the seven countries on Trump’s banned list (i.e. from authors who identify as being from Iran, Iraq, Libya, Somalia, Sudan, Syria, and Yemen) that have been created in response to Trump’s travel ban, or can be interpreted as such. If selected for publication, the work will run either in our Translation Tuesday showcase at The Guardian or in our Spring 2017 quarterly edition (or both). Submissions of original English-language work will only be considered for publication in our Spring 2017 edition. For works in English translation, the decision as to where the work will be placed rests entirely at the discretion of our editor-in-chief, who curates Translation Tuesdays at The Guardian and who will be assembling this Special Feature. While other guidelines from our submissions page apply, contributors to this Feature only will be paid at least USD200 per article. To make sure that the articles from this Feature are circulated widely, we will leverage on our eight social media platforms in three languages, and, depending on whether our crowdfunding campaign meets its target, paid ads in high-profile media outlets to promote them for maximum impact.